Salehi, M., Goorkani, M. (2017). Optimum allocation of Iranian oil and gas resources using multi-objective linear programming and particle swarm optimization in resistive economy conditions. 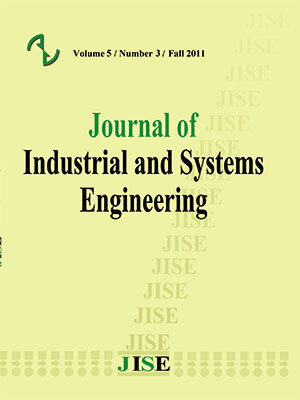 Journal of Industrial and Systems Engineering, 10(4), 43-68. Mojtaba Salehi; Mohammad Mahdi Goorkani. "Optimum allocation of Iranian oil and gas resources using multi-objective linear programming and particle swarm optimization in resistive economy conditions". Journal of Industrial and Systems Engineering, 10, 4, 2017, 43-68. Salehi, M., Goorkani, M. (2017). 'Optimum allocation of Iranian oil and gas resources using multi-objective linear programming and particle swarm optimization in resistive economy conditions', Journal of Industrial and Systems Engineering, 10(4), pp. 43-68. Salehi, M., Goorkani, M. Optimum allocation of Iranian oil and gas resources using multi-objective linear programming and particle swarm optimization in resistive economy conditions. Journal of Industrial and Systems Engineering, 2017; 10(4): 43-68. This research presents a model for optimal allocation of Iranian oil and gas resources in sanction condition based on stochastic linear multi-objective programming. The general policies of the resistive economy include expanding exports of gas, electricity, petrochemical and petroleum products, expanding the strategic oil and gas reserves, increasing added value through completing the petroleum value chain and decreasing crude oil and gas sale. The proposed mathematical model includes three objective functions: minimizing imports of petrochemical products and crude oil sale, maximizing economic benefits, and minimizing the environmental pollutions. The model includes constraints of gas, oil, and electricity flow balance and also supply and demand capacity constraints. A Pareto-archive-based particle swarm algorithm was used to solve the model. The results of proposed algorithm were compared with NSGA-IIresults. The comparison showed the proposed algorithm is more accurate in solving of the energy resource allocation model in 2016-2031 timespan. The results of this study can present helpful solutions to oil and gas resource allocation planning in Iran. The main contribution of this paper is proposing a new stochastic linear multi-objective programming with considering the general policies of resistive economy and solving the model with a new Pareto-archive-based particle swarm algorithm. R.K. Agrawal, S.P. Singh. (2001). Energy allocation for cooking in UP household (India) A fuzzy multi-objective analysis. Energy Conversion and Management; 42: 2139-2154. Ali-Khani , Aadel; Rshidi Komeijani, Ali Reza (2011)." Random Planning Model for Allocating the Gas Resources in Iran with the Approach of Energy Security Cost" Management future studies, Vol. 23, Pp.25-36. Asaadi, Freidoon (2007) "The Importance and Necessity of Optimization and Reduction of the Intensity of Energy Consumption", council and research, 13th year, No.54. 253-278. A.R. Borges, C.H. Antunes. (2003). A fuzzy multiple objective decision support model for energy-economy planning, European Journal of Operational Research; 145(2): 304-316. Deb, K., Pratap, A., Agarwal, S., & Meyarivan, T. A. M. T. (2002). A fast and elitist multi-objective genetic algorithm: NSGA-II. IEEE transactions on evolutionary computation, 6(2), 182-197. Glassner martin & Fahrer chuck, Political geography, (USA: John Wiley & sons, inc 2004), p: 271. Gharibnavaz, K. and R. Waschik. (2015). “A Computable General Equilibrium Model of International Sanctions,” GTAP conference paper series. Hashemi pour Rafsanjani, Hasan; rajabi Kalcateh, Yahya (2011). "Optimization of allocating Gas to One of the Oil Field of Iran for Lifting by Gas" thesis. Sciences ministry, Research and technology, Haidar, Jamal I. (2015). “Sanctions and Export Deflection: Evidence from Iran.” Paris School of Economics. Kerman Shahid Bahonar University- Engineering and Technical School, Master of degree. Kazemi, Aalieh; Shakouri, Hamed; Shakiba, Shiva; Hossein Zadeh, Mahnaz (2013)." Selecting the Aprppriate Model for Allocation of Energy in Iran by Using the Process of Hieratical Analysis" The publication of Iran Energy, Vol. 16, No.2, Pp. 31-61. Kazemi, Aalieh; Mehregan, Mohammad Reza; Shakouri Ghanjavi, Hamed; (2011)." Presenting a Multi- objective Linear programming Model for Optimal Allocation of Iran Energy Resources". Prospect of industrial management, No.3, Pp. 43-65. Kazemi, Aalieh; Mohammad Reza; Shakouri, Gangavi, Hamed(2012)" Presenting the Model of Offering the Energy of Iran with the Purpose of Greenhouse Gases" Publication of industries engineering, No.1, Vol. 46, Pp.63-75. Kennedy, J., & Eberhart, R. C. (1995). Particle swarm optimization. International conference on neural networks (Vol. IV, pp. 1942–1948). (Perth, Australia), Piscataway, NJ: IEEE Service Center. Loulou, R., Goldstein, G., & Noble, K. (2004). Documentation for the MARKAL Family of Models. Energy Technology Systems Analysis Programme, 65-73. T. Mezher, R. Chedid, W. Zahabi. (1998). Energy resource allocation using multi-objective goal programming: the case of Lebanon. Applied Energy; 61: 175-192. NG, D.W.K., S.Lo, E., Schober, R. (2013). Energy-Efficient Resource Allocation in OFDMA Systems with Hybrid Energy Harvesting Base Station. DRAFT,year PP: 2:32. Saungmuang, W., Suthammanon, S., Penchamrat, P., Sirivongpaisal., (2013), Design and Model of Supply Chain Network for the Biodiesel Refinery Industry in the Southern Region of Thailand., American International Journal of Contemporary Research., Vol. 3, No. 4. M. Sadeghi, H. Mirshojaeian Hosseini. (2006). Energy supply planning in Iran by using fuzzy linear programming approach (regarding uncertainties of investment costs), Energy Policy; 34: 993–1003. Seebregts, A. J., Goldstein, G. A., & Smekens, K. (2002). Energy/environmental modeling with the MARKAL family of models. In Operations Research Proceedings 2001 (pp. 75-82). Springer Berlin Heidelberg.